Silhouetted by the Blue by Traci L. Jones. Grades 5-8. Farrar, Strauss, & Giroux, 2011. 200 pages. "Take care of my boys, baby girl. Take care of them till I get home." That's what Serena's mom told her before she left on a business trip... but she was in a car accident and never came home. Now Serena's trying to deal with her grief while she keeps up with everything else. Memories of her mother lurk everywhere, but Serena doesn't have the luxury of wallowing in her sadness. Instead, she has to pick up her little brother from school, do laundry, attempt to finish her mound of homework, and memorize lines for the school play. She wishes more than anything that her dad would get out of bed and take charge, but her father's sleeping and crying all the time these days. Serena's dad has "had the blue" (as her little brother would say) from time to time, but before, her mom was always around to take care of him. Can Serena see them through until her dad feels better or will her dad's blue swallow them all this time? This is a beautiful story about a likeable middle schooler who's feeling very lost. It's fitting that the play Serena is starring in is The Wiz, a story about a girl who's lost in a very strange place, just wanting to go home. Serena wants to go home, but the home she knew - where she had happy Friday night dinners with mom, dad, and brother Henry - doesn't exist anymore and no one in her family knows how to move on. Art plays a big part in this story, and it's not just Serena's singing and acting. Her father is a children's book illustrator and Serena's friend Elijah is an artist, as well. The "blue" of depression is saturating Serena's life as she realizes that she can't count on her dad to pick up Henry from school or even to buy toilet paper. Periodically lightening the mood is Serena's blossoming friendship with Elijah, an artistic boy in her Spanish class who keeps telling her sweet things in Spanish. It's obvious he cares for her, and as their friendship grows into an innocent something-more, moments talking to Elijah become bright spots in her gray, dreary days. I wasn't entirely convinced by the dialog - the occasional slang felt a bit forced - but I really enjoyed knowing the characters. Traci L. Jones ratchets up the tension as Serena's dad continues a downward spiral and Serena begins to search desperately for help. When I was in middle school, I loved tearjerkers. Give me any Lurlene MacDaniel book, the more melodrama the better. 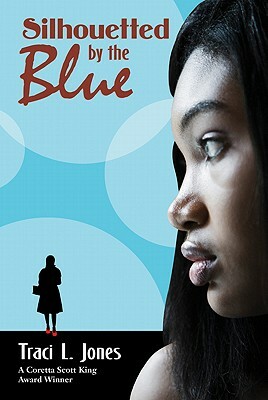 Silhouetted by Blue is a beautiful book that's tween-appropriate but a little on the edgy side. I'd hand it to tweens who are wanting sad stories or edgy books but who aren't ready for some of the more mature content found in many edgy YA books. Silhouetted in Blue is on shelves now!